Quick Kush is a feminised cannabis seed that speeds the legendary OG Kush up. While the most notable Indica ever needed some 55-63 days to flower, this Quick version is ready for harvest in just 49-56 days. But don’t be fooled by her flowering time: quicker doesn’t mean of poorer quality. She’s still armed with the oil and lemony scent that has attracted so many devotees throughout the history of cannabis as well as with the mind-blowing effect of the most famous strain in California. Because she’s indeed a full-on OG Kush, but way faster. Morphology: Spawned from an OG Kush elite clone of ours and a selected male from our OG Kush Auto elite line, Quick Kush turns into a slender, mid-sized plant with large leaves and evenly distributed elongated branches. To these amazing qualities, we must add an exquisite beauty that certainly lives up to her predecessor’s. If her scents, flavours and effects weren’t so exceptional, she could well be a perfect ornamental plant noted for her elegance and splendour. Yield: Quick Kush is as productive as the original version. Let’s not forget that OG Kush was known, among others, for her incredible yielding capacity, which is, by the way, kept intact in this fast version capable of producing half a kilo indoors and up to 1 kilo outdoors. In terms of quality, she’s the best, as is to be expected from the most famous strain of the west coast. Expect many buds all over the multiple branches of this plant; incredibly compact and resin-packed flowers endowed with an extraordinary potency. Aromas and flavours: Quick Kush has the power to hypnotize crowds of cannabis lovers with her mostly oily and lemony scent highlighted with smoky undernotes. She will surprise those who come to meet her, that’s for sure. Although the mixture may seem quite strange at first, there must be a reason why everyone rushes back to her again and again, mustn’t there? Effects: Quick Kush delivers a pretty potent high. Her being quicker than the ‘normal’ version means that she’s exposed to more hours of sunshine and heat, and so reaches her potential more easily, boasting very high THC levels.The quick rendering of the legendary OG Kush mirrors her mother’s effect. And, obviously, with such high THC rates, it is not a bearable effect, but a really strong kick that is more suitable for fearless cannabis heavyweights. 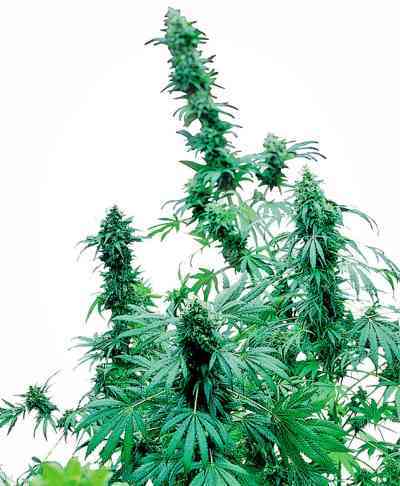 Cultivation: Quick Kush is ridiculously easy to grow. Fair and square: she’s super resistant, super quick and super grateful. You can spare yourself for other genetics because this one will not demand much attention. She feels at ease in warm and dry climates, and she doesn't require heavy feeding. In fact, a standard watering and feeding regime will be enough for the most famous girl in California to produce numerous thick buds in some 50 days. OG Kush takes quite a lot of time to flower. That’s why we thought that pushing the accelerator a bit would be an interesting twist. A well-founded decision that our team of breeders made after intensely working with this strain. OUTDOORS: Lower climate-related risks: in the northern hemisphere, OG Kush is ready for harvest in October, sometimes early this month or by mid-month (Mediterranean area and southern Europe) and in other cases by the end of/mid-October (the rest of Europe). But, thanks to the quick blooming of this Quick version, which is one to two weeks faster, harvest time will arrive after 49-56 days of flowering, by mid-September in southern Europe and a month later up in the north. Her buds will be ready earlier than usual, which means that we’ll no longer have to worry about the rainfall and low temperatures that autumn generally brings with it. INDOORS: Greater cost-effectiveness: the Quick version is indeed far quicker. Yes, but how quick? Well… about 20 % quicker. This means that, should you decide to grow indoors keeping the lamps on all year long, with OG Kush you’ll obtain 6 crops per year, while with Quick Kush it’s possible to get 7.5 crops/year. No more and no less than 1.5 extra crops per year. Pretty good, right?